Automatic Devices Company's Cubi-Trac® has long been considered the premier cubicle curtain track line of North America. ADC's cubicle systems and curtains are manufactured in Allentown Pennsylvania by skilled craftsmen who take pride and ownership in the products they produce. From a single track system for a doctor's office to equipping an entire heath care complex, we handle it all. Offering a full line of hospital cubicle tracks, track components, cubicle curtains and IV support systems, ADC is your one stop source for cubicle equipment. ADC does not subscribe to the concept of "pre-sized" systems and curtains that you have to make fit to your application. Rather we manufacture everything to your specifications and with your fabric choices, right here in Allentown, Pennsylvania. Need a custom curve? No problem we factory curve cubicle track to just about any configuration imaginable. Want to use a special fabric for your curtains? No problem, we sew the curtains in our factory too, and we deal with most of the fabric mills in the U.S., so we can sew and deliver those custom curtains quickly. We can supply curtains with or without mesh, double sided, lined or fabric backed. Just call one of our representatives with your needs and they will be happy to point you in the right direction. ADC also provides movable intravenous (IV) support systems that can travel in our specially designed tracks, even curved tracks. This allow you to position your IV bottles and bags where you need them relative to the patient's bed without taking up floor space and creating a potential tripping hazard. We have fixed height pendants that can handle up to 4 bags or bottles and vertically adjustable pendants for even greater flexibility. 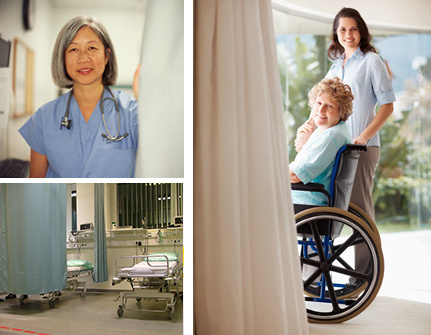 You spent a lot time, energy and money designing and building your health care facility, choose cubicle systems that reflect your passion for quality, choose ADC Cubi-Trac® systems.